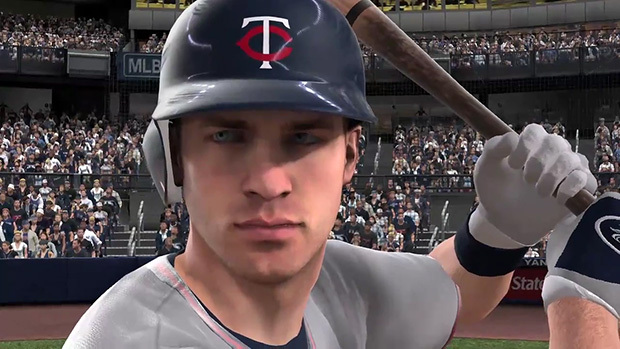 Sony has just released a new trailer for MLB 11 The Show, and this one features Minnesota Twins catcher Joe Mauer, who is on the cover of the game for the second year in a row. I wasn't aware that Mauer's performance against my favorite baseball team had earned him the name "Yankee Killer," but apparently, that's what SCE San Diego has dubbed him. In the two-minute clip, Mauer drills an 0-2 C.C. Sabathia pitch down the left-field line at Yankee Stadium for a two-run double, putting the Twins ahead by one. Of course, the trailer obviously doesn't take the 2010 American League Division Series into account. In a three-game sweep by the Yankees, Mauer went 3-for-12 with a walk, no runs scored, no extra-base hits, and three strikeouts. It wasn't Mauer who "killed" the Yankees in the playoffs last year, but the pitching staff of the Texas Rangers. Oh, right -- videogames! Sony's MLB 11 The Show will be out on March 8th, just four weeks from tomorrow, for PS3, PSP, and PS2. I'll be posting a hands-on preview of the game very soon.